Atiku Seriously Searching For Vice President From South East? There are indications that presidential candidate of the Peoples Democratic Party (PDP), Alhaji Atiku Abubakar, has narrowed his search for a running mate to the South East geo-political zone. It was gathered that the search for the party’s vice president’s slot has further been narrowed to Enugu and Abia states. Who will get? The PDP has till October 18 to submit the names of its presidential candidate and his running mate to the Independent National Electoral Commission (INEC) in line with the commission’s timetable. A PDP source who is privy to the decision at a meeting of the South East caucus of the party held in the build up to the presidential primaries, told LEADERSHIP that the position was further narrowed to the two South East states. The source added that deputy Senate President Ike Ekweremadu; former minister of Finance, Ngozi Okonjo-Iweala and Senator Enyinnaya Abaribe were mentioned during the meeting. The space was also open to persons from other state in the zone, with former Anambra State governor, Peter Obi, tipped as a possible choice in the event where those considered from the two states are rejected. It was learnt the former vice president was open to work with the former minister of finance who has represented Abia State in the past but, stakeholders from the state opposed his choice. A move to replace the minister with the incumbent governor was also resisted by “other governors and party chieftains at the meeting who said he was not qualified for the position. It was also gathered that the South West has also launched a lobby for the position on grounds that it would serve as compensation for the way the region was sidelined during the national chairmanship contest last year, which went to the South South. 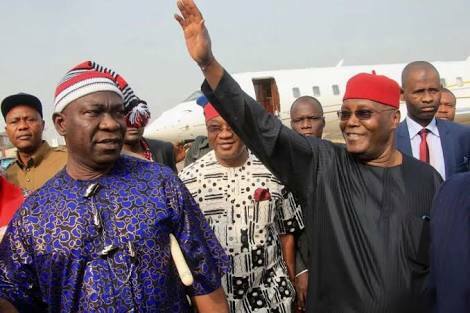 Meanwhile, Ohanaeze Ndigbo yesterday insisted that only a running mate from the South East will be a suitable pair for PDP to win the 2019 presidential election in the zone. Reacting to the victory of former Vice President Atiku, Ohaneze Youth Council Worldwide led by Mazi Okechukwu Isiguzoro said Atiku is the right man for the job. The youth wing of socio-cultural group warned however that Ndigbo would work against PDP if Atiku fails to pick his running mate from the Igbo extraction. Isiguzoro said, “Majority of Igbos believes in Restructuring and majority of Igbo youths wants referendum because of the economic hardship in the country. We believe that Atiku campaign for restructuring will win the hearts of Nigerians and a possible pair of running mate from South East will quell the quest for referendum by agitators and Igbo Youths. “We insists that any betrayal of denying Ndigbo the vice presidential slot of PDP will make Ndigbo dump PDP in the presidential election, but vote PDP in the gubernatorial elections in Abia, Ebonyi and Enugu”,. The group further said that the zone has better personalities like Peter Obi, Ngozi Okonjo Iweala, Senator Ike Ekweremadu and Senator Enyinnaya Abaribe who are fit for the vice presidential job. The group warned that it will work against the PDP by mobilising youths in the zone to vote for another party if Atiku fails to pick his running mate from the South East. Atiku on Sunday defeated 11 other aspirants to pick the party’s ticket. He is main challenger to incumbent President Muhammadu Buhari of the All Progressive Congress (APC) in next year’s presidential election.